Including by President Trump who has trotted out that old trope once again after the latest mass school shooting in Florida, suggestion that arming teachers is a solution to increasing school safety. 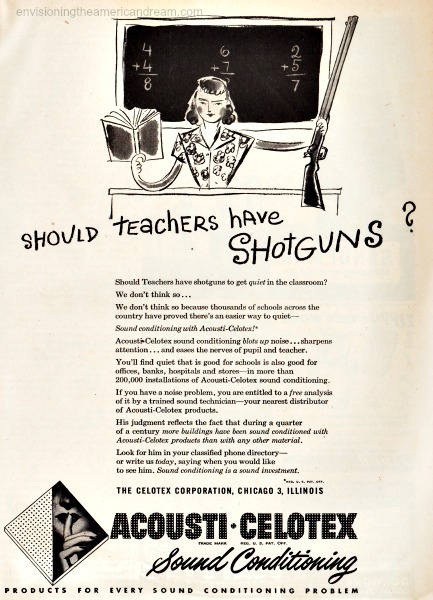 With that logic, than answering the question posed by this vintage illustration above is a big resounding “yes” teachers should carry guns in the classroom even shotguns. “Should Teachers Have Shotguns to Get Quiet in the Classroom? the headline asks the reader innocently. OH HELL NO! !As a former NYC teacher, I can tell you there are as many unhinged teachers as students — even more so!!! Just such an absurd idea that I truly cannot believe that anyone ever even thought of it. Leave it to Trump!! He thinks of things nobody in his right mind ever imagined. Some would say that’s why he has been a successful businessman, but I say it’s the reason we should all be very afraid. Of course the presence of more guns only makes it worse. I lived with a gun dealer decades ago, and just carrying a gun tucked away ‘just in case’ made everything feel escalated. We were both martial artists, so in the ordinary scheme of things, if there were badguys, we could in theory stop them with clever moves and it was very unlikely anyone might get killed. While carrying a gun though, there was always that extra level of ‘but if it’s needed…’, which was a jerk idea, even when I was young and strong and sane and sober and not a hothead, plus also trained to use guns. From a leader who has been financially bankrupt 5 times and is morally broke. Retired 27 years from M-DCSB after zero shootings (thankfully). There are so many things wrong with this idea it’s hard to know where to begin. Let’s start with the most basic rule of gun safety: Never keep a loaded gun where children can reach it. A classroom would present an obvious problem; when children are present, a gun should be kept separate from the ammo, preferably in a locked drawer or cabinet, and the teacher would need to wear the key to that drawer at all times. In ten years as a high school teacher I did have things stolen from my desk, my purse, and my jacket — not often, but a teacher with 35 students isn’t always close to the desk. Another basic: a gun is not a shield. A law abiding person carrying a concealed weapon can be shot before he or she has time to draw it. And these mass shootings are not committed with handguns; we are talking about weapons that can fire dozens of bullets in less than a minute — bullets that pass right through walls and doors and people. In far less than 30 minutes, about 30 people at the Florida school were shot, 17 fatally. The Las Vega shooter fired 1,100 rounds, injuring over 800 people, in ten minutes. There’s talk of arming school guards with assault weapons, but rapid-fire weapons are not known for their accuracy — as any soldier can tell you — which is why we don’t want our police using them in areas crowded with civilians. Maybe Chris Rock was right, years ago, when he said the problem isn’t the guns, it’s the bullets. He fantasized about a future where a fight would end with one man saying, “I’m gonna work, and save, and when I have enough money to buy a bullet, I’m gonna ….” If only. Good reply. In addition, a teacher armed with a handgun would be hopelessly outmatched against a shooter with a high powered rifle. We all agree that the idea is without merit. Why stop at arming teachers? You should also arm principles, janitors, nurses, social workers, lunch ladies, crossing guards and bus drivers. Two million more guns, what could possibly go wrong?!? Remember the Oregon college shooting where there actually was a fellow carrying (legally) a gun. He didn’t attempt to stop the shooter with it out of concern the police would confuse him with the bad guy and engage him in gun fire! He was the so-called good guy carrying a gun you hear about, and he had the good sense not to use it because he was smart and realized his contribution to the mayhem would just confuse matters more.